Sometimes young people are hesitant to try new things. 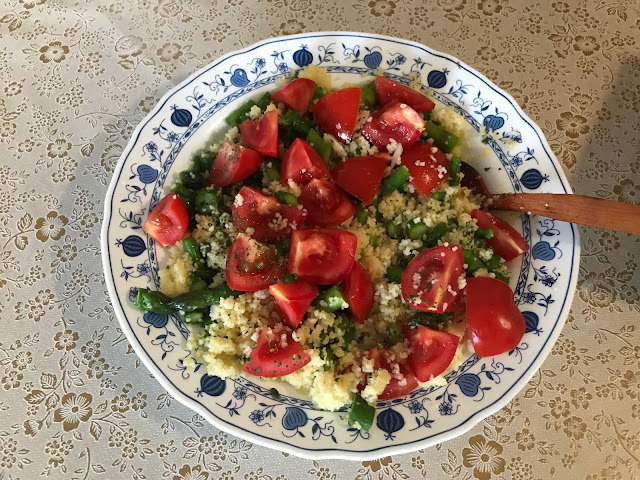 This couscous and asparagus salad was a great success with the seven young missionaries from the Church of Jesus Christ of Latter-day Saints who recently had dinner with me in my apartment in Pristina, Kosovo. Bring a large pot of salted water to a boil, add asparagus and cook until tender, about 3 minutes. Remove with a large slotted spoon and rinse in a colander in the sink under cold water to stop it from cooking. Add the couscous to the boiling water and cook according to package directions. Chop the asparagus into small 1/2 inch pieces. Drain the couscous and rinse under cold water, place in a large bowl. Add the chopped asparagus, tomatoes, red onion, lemon juice, olive oil, parsley, salt and pepper to the bowl. In March 2018 Melanie and I visited Paris. One of our favorite places is the Notre Dame Cathedral. Although I have been to the Notre Dame many times in the almost 7 years I have lived in France, I am awed each time I visit. I am grateful that we took time on this trip to explore the archaeological site under the Cathedral as well as to go into the building itself. Built between 1163 and 1350 on the Île de la Cité, Notre Dame de Paris is one of the oldest gothic cathedrals in the world. In English the name of the cathedral means 'Our Lady', and it is dedicated to the mother of Jesus. During the last eight centuries, the cathedral building has been renovated and restored several times. The last major renovation was in 1845. Outside Notre Dame 1000s of pigeons come to feed. With a little grain they will climb all over you. We entered the Cathedral through the doors under the two front towers.. The cathedral has two towers standing 226 ft (69 metres) tall on its front. Visitors can climb to the top to see magnificent views of Paris as well as visit the bell tower, where the Victor Hugo's Hunchback of Notre Dame lived. From that vantage point, one could get a bird's eye view of the cathedral’s multiple gargoyles.The access to climb the cathedral’s two towers was on the North Tower (rue du Cloître). Visitors climbed 387 steep steps, since the cathedral doesn’t have an elevator. The organ has over 8,000 pipes. It is positioned high above the doors of the Cathedral in the back where you enter. The stone work is magnificent. As are the stained glass windows. In the midst of World War II, it was rumored that the Nazis might destroy the stained glass. It was therefore removed and only reinstalled again after the war had ended. The Rose window is supposed to be the biggest glass window in the world produced in the 13th century. Sometimes when I sat in silence and took in the peace and beauty of my surroundings, I would fall asleep. The last time I visited Notre Dame, I sat in the back pew and just enjoyed a moment of peace and contemplation. I enjoyed sitting and contemplating the beauty of this edifice built I felt as a tribute to Jesus Christ. I marvel at the faith and devotion of the builders. It took over two hundred years to build. Those who laid the first stones would never see the building completed. But they must have had a vision of something great they were working on. One day a traveller, walking along a lane, came across 3 stonecutters working in a quarry. Each was busy cutting a block of stone. Interested to find out what they were working on, he asked them each what they were doing. The first worker said, “I am making a living for me”. The traveller turned to the second worker and asked him what he was doing and he said, “I am doing the best job of stone cutting in the entire country.” Then the traveller turned to the third worker. He seemed to be the happiest of the three and when asked what he was doing replied: “I am building a cathedral. Today, April 15, 2019, the Notre Dame is in flames. I'm sorry my children that you will not see the building as it was. We should have taken you when you were young. Notre Dame has been part of my life since I was 11 years old when I first visited Paris. I saw it many times during the 18 months I lived in Paris as a young man. I loved the building. I'm saddened by this great loss. But I am confident a new edifice will be built that is equally beautiful. I may not see it, but you will.